During the first half of 2013, Jobfeed made an analysis of the German, Dutch, and French labour markets. The comparison of these figures yielded very interesting insights. The chart below shows a comparison of the market share of the ten largest occupational groups in the three countries. The most online jobs in the Netherlands (14%) and Germany (11%) are in ICT. Note: in France only 6% of all online jobs are in ICT and is thus the 7th largest occupational group. In France, sales and trade leads with 13%. A profession class that is also striking is Hospitality. In France there are about as many online job opportunities for hospitality as for ICT. The proportion of catering jobs (5.7%) is almost 2.5 times as large as the share of hospitality jobs in the Netherlands (2.3%). Organisations post their jobs more often on more than one website. The Netherlands excels in this. On average one vacancy can be found on four* sites. This is much higher than in Germany (1.7*) or France (2*). Nevertheless, not all professions are placed so freely on multiple sites. 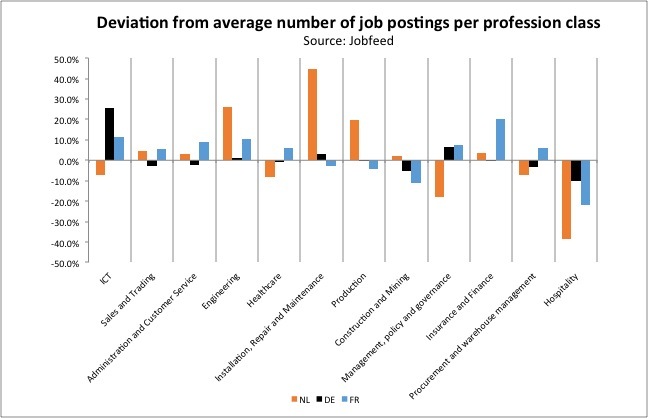 The graph below shows the deviation from the average number of placements per profession compared with each country. This is the case in all three countries, but especially in the Netherlands where there is a large difference (-38%). 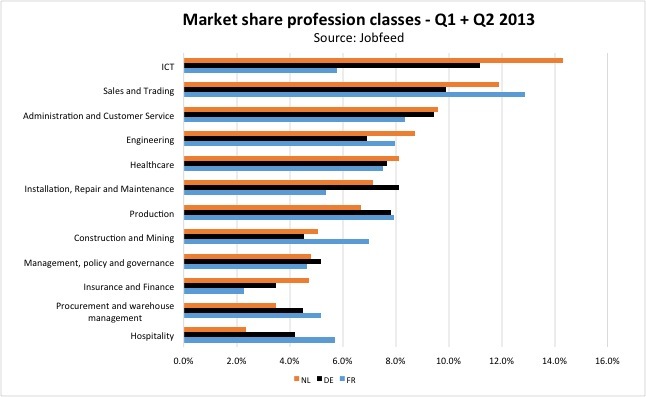 Other notable results: ICT is the largest occupational group in the Netherlands, but is posted less frequently on multiple job boards than the average. This is in contrast to Germany and France, where there is a notably higher placement on multiple job boards, 26% and 11% above the average respectively. Figures are from Jobfeed NL, DE and FR. This analysis results from online job vacancies found in the Netherlands, Germany and France. Internships, student jobs and volunteering are omitted. Jobfeed collects all the job-expressions online and de-duplicates them, making it possible to report on unique job vacancies and job postings*.